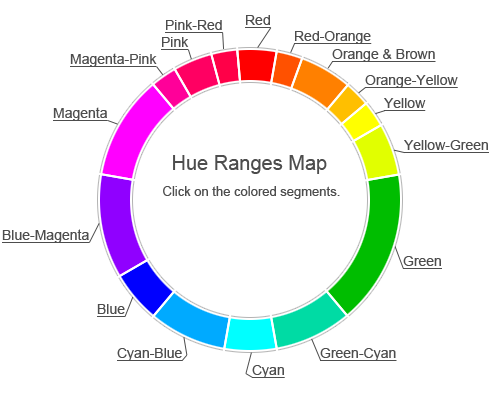 This and the following pages show a set of colors with their name, structured by sixteen predefined hue ranges and the range sets ordered by luminance. For blue-magenta color a hue range from 241° to 280° has been defined. Browse fullscreen mode (usually press [F11]-key) to reduce color distraction. Click on a color rectangle to import a color into the HSL/HTML Color Picker. You can also browse the colors as a one-page color chart ordered by name. The following link leads to our introduction to color names.